Some Views of Horns Bridge Chesterfield. Once a congested area out of Chesterfield, (so today it’s a very congested area at times out of Chesterfield for different reasons). On the ground level is the road network to Mansfield (Hasland) A617 and Derby (Wingerworth) A61 and two rivers the Hipper and Rother which often flooded. It included the Great Central Railway Chesterfield Loop. On the middle level was the Midland Main Line and Brampton Loop Line. 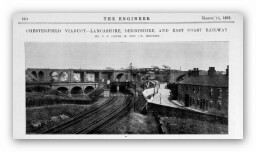 On the upper level was the Lancashire Derbyshire and East Coast Railway Lincoln Line. Horns Bridge Area fom LD&ECR Plans.